In their day, they ranked from the downright unpopular to the unrivaled best seller. But as time went by, prince and pauper alike rose to supernova status. Today, they are the toys that dreams are made of. Today they are... Toys of Legend! 1. Place a licensed space product into the mixing bowl. 2. Add a pinch of creativity. 3. Pour in a generous portion of advertising. 4. Simmer until just right. If the instructions were followed correctly, it seemed that the voracious public would consume as much as you could serve them and still want more! 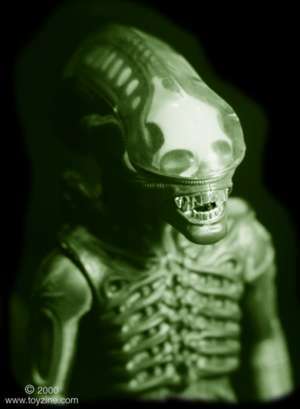 With this kind of a gastronomic frenzy surrounding them, it was no wonder that Kenner leapt at the chance to produce licensed action figure toys for what was touted as being the next big thing in sci-fi... 'Alien'. No other move would have made any sense. Star Wars was the best thing to happen to Kenner, and in 1978, when the 'Alien' decision was made, they could barely keep up with production demand for anything with a Star Wars label on it (Star Wars lavatory brushes? Sure! I'll take one!). The best way to keep ahead of the many eager competitors biting at the heels of their space boots was to ensure that they were in front. 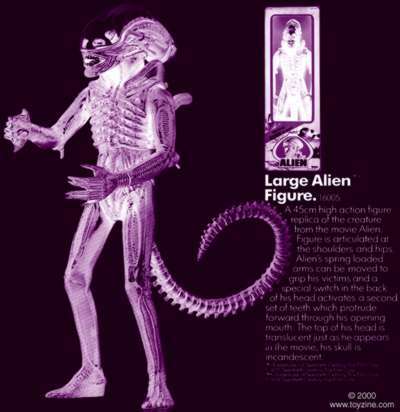 That any new hit space movie concepts were captured as quickly as possible for their toy licensing possibilities... and so it was with 'Alien'. Once contracts had been signed and hands had been shaken, Kenner's designers went to work. It is at this point in the narrative that a promo catchphrase from another, more obscure sci-fi movie comes to mind... a mid-1970's flick called 'West World', about an adult amusement park filled with vengeful androids: "West World, where nothing can possibly go WORNG"
Well, it was at this stage in the streamlined, well ordered machine of Kenner's Alien toy line that things started to go WORNG. Initially, the concept had seemed perfect. New space movie, big Hollywood budget, great special effects, and big scary monster. No, this was better than perfect. This was fail safe! So, 'fail safe' in fact, that perhaps a few things were overlooked. Firstly, this was to be a scary movie. Sure, Star Wars had a few minor league scary moments, but it was always rollercoaster scary, not Frankenstein scary. And let's take a look at the bad guys here! Darth Vader, the love-to-hate villain in the tradition of the would be world conquerors from the olden days adventure serials fits perfectly into the sprawling space thrill-o-rama that is Star Wars. The Alien also fits perfectly into its movie environment. Designed by weirdo surrealist artist, the Swiss born H.R.Giger, this outworlder has to be the most disgustingly beautiful creature ever to be gestated by the motion picture industry. Heavily accented by Giger's 'bio-mechanical' style of art, the Alien in its full grown state is enough to make Darth himself commit cosmic Hari-Kiri and swallow his own lightsabre! Even battle hardened studio executives were freaked out when they first sighted the creature on celluloid during in-house showings of the movie's early takes. If those folks couldn't stomach it, what chance did the Star Wars eyed kid armed only with a box of popcorn and a soft drink have? (Interesting aside: apparently, when Giger was little, his favorite place to play was down in the family basement by himself, with the light out, under a big table covered a large black tablecloth... yeah, just your average kid, I guess! ).